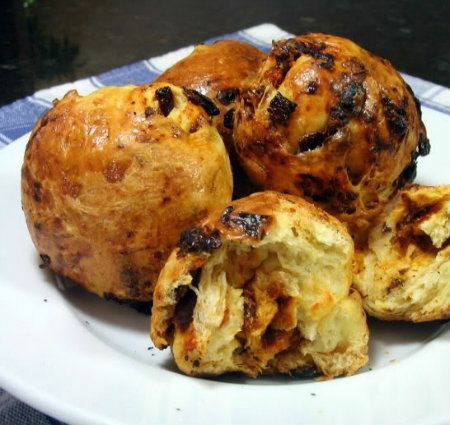 This is another recipe for quick, flavorful dinner rolls. The secret ingredients are sun-dried tomatoes and butter - lots of butter. I originally thought these rolls would taste like pizza or a strongly flavored focaccia bread. I was pleasantly surprised to find only a hint of tomato flavor in the finished rolls despite using tomatoes that had been packed in herb-flavored olive oil. This is a great roll for novice bread bakers. These would be a nice accompaniment to a hearty soup or plain grilled meat. 1) Combine flour, yeast, salt in a 2-quart mixing bowl. Whisk to combine. Add butter, milk and eggs and mix with a spoon until a dough forms. 2) Turn dough onto a lightly floured work surface. Knead for about 5 minutes. Alternately, use an electric mixer with a dough hook and mix until dough climbs hook. 3) Place in a greased bowl. Let rise until doubled in bulk, about 1 to 1-1/2 hours. 4) Spray a cookie sheet with nonstick spray. Preheat oven to 450 degrees F.
5) Punch dough down. Turn onto a lightly floured work surface. Knead in sun-dried tomatoes. Divide dough into 8 pieces. Shape each piece into a ball and place on cookie sheet. Cover lightly and let rise until doubled in size, about 30 minutes. 6) Brush rolls with milk. Bake in preheated oven until golden brown, about 10 to 15 minutes. Cool on a rack. Yield: 8 rolls. Love fresh rolls and these look great. I love dinner rolls; it adds polish to a nice meal, I think. Beautiful glaze on them, and they look so delicious with the bits of sun-dried tomato in them! I had to come down here quick when i read sun dried tomatoes - my very favorite. The rolls l! Mary these sound delicious. They are definitely unique with the sun dried tomatoes!! Your Photo is wonderful!! Yummy rolls. Thank you for posting them. I love the sun-dried tomatoes. Jeanne, I'm so glad you've come to visit. I hope you become a regular visitor. Okay those look delicious, I love SD tomatoes in bread. A basket of these would be the showpiece of the dinner table, so beautiful! Not a big fan of sun dried tomatoes, but if the tomatoe flavor is only a mild one, these are a must make....buttery and flaky and beautiful to look at! Elle, welcome to One Perfect Bite. I hope you'll be a frequent visitor. They are beautiful! Buttery sundried tomato.. these words won my heart. Ohh these look so good. I know why I come over here, I get to eat with my eyes first. I'll have to give these a try... they sure look good and they really would be the perfect thing with a good bowl of soup. Dried Tomatos in fresh rolls, that sounds so delicious! I want u to know that u have enjoyed testing out your recipes as it always give me good result. Thank u so much for being such a blessings to me. May I know whether I can use canned olive instead of dried tomato since I am from Malaysia.